Hangouts 4.0.100147489 APK is now coming to Android and now you can download it for free to get all the features of this app on your phone. This is free and it has excellent services. In messaging system, Google has been somewhat lagging behind its competitors. Application of the Internet giant’s social communication that are divided in different applications. For this reason Google introduced the Hangout, a unified messaging service that will replace Google Talk, Google+ Messenger, and Google+ Hangout video chat. 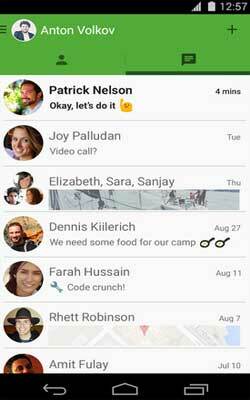 Hangout messaging application form, together with WhatsApp and Facebook Messenger is a direct competitor. Faced with this competition, Hangoout rely on a number of uniqueness. Unlike instant messaging applications in general, it does not display the contact list, but a list of the most recent conversations. Each conversation can be named as a chat room, can also add a label in the form of an image from the collection emoji Google. Contact list itself remains available. Users only need to swiping a finger to the left of the screen to see it. Hangout save a conversation on the Google cloud network so that the messages, including photographs, can still be seen until many years later. Another advantage is that users can send messages to friends anytime they want, even if the target is not connected to the network. Such services with similar names in Google+, Hangouts app also offers video calls can be made ​​simultaneously by 10 users at once. Send and receive both Hangout and text messages (SMS/MMS) and easily switch between message types. Include all your friends with group chats for up to 100 people. Say more with photos, maps, emoji, and animated GIFs. Turn any conversation into a free group video call with up to 10 friends. Make phone calls (and all calls to other users are free!). Connect with friends across Android, iOS, and web, and sync chats across all your devices. Message friends anytime, even if theyre offline. Latest update brings a UI redesign which brings it inline with the look and feel of other android apps. A little choppy around the edges but so far I really like it.